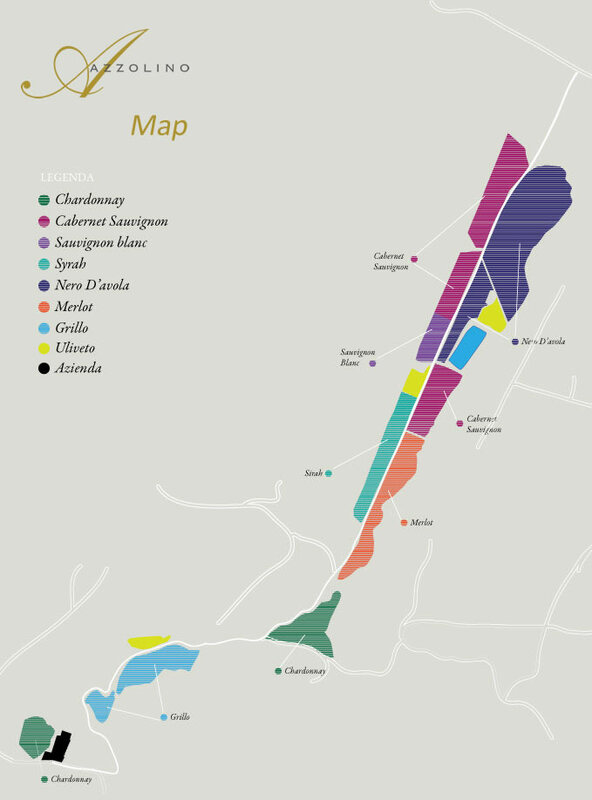 Azzolino farms is the natural evolution, in a modern and sustainable, a former winery of Camporeale. Now an entrepreneurial and market-oriented, which takes advantage of the strength of the union of two families, bearers of experience and know how different, giving new energy to the company seeking to carry out, as early as the vineyard, a high and quality with its precise market positioning, cha looking with interest abroad. 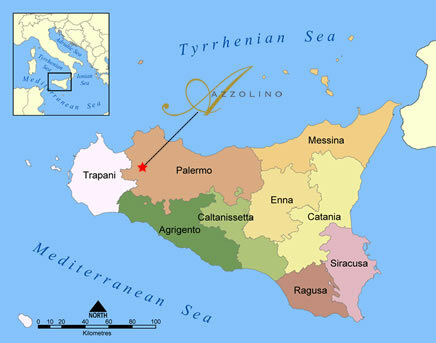 Located 400 m above sea level, it is named after the neighborhood in which it stands, in the territory of the town of Monreale, and is 50 Km from the city of Palermo. The company is characterized by a natural environment and climate very special, if not unique: its vineyards in fact take place by the first rays of the morning sun and take advantage of the cool evening breezes. The great vegetation, hills around, the olive trees that surround the crops seem to protect these wonderful white and red grapes that grow naturally healthy and lush. The company in the past has been an important producer of white wines from native grapes. Today it produces quality wines both red and white grapes from their vines regional and international. The method of cultivation is strictly biological methods are among the most sophisticated but are never forgotten the old traditional principles of the campaign. The grapes, winemaking and aging of the wines are made with great care and dedication in the pursuit of a better quality and elegance of the products. It's a company that operates with great tenacity and enthusiasm, aware of its strong roots, respectful of all that the country requires: love, sacrifice and passion. Wine-Making Process: Short low temperature maceration and then a long fermentation. Aged in steel, then French Oak barriques and then another 6 months in bottle. Tasting Notes: Ruby-red color. Intense and persistent scent of mature black fruits and spices. In mouth it is balanced, tannic and persistent. Food Pairing: First plates with strong intensity, braised meats, lamb, sausages and aged cheese. Wine-Making Process: Cold pre-fermentation maceration and slow fermentation under the skin and partly in French barriques. Sharpening in steel and subsequentely in bottle. Tasting Notes: It is balanced, medium bodied and full of rich and juicy fruit flavors. The warm Sicilian sun and fresh night breezes across the island provide the perfect climate for growing Merlot grapes with bright fruit aromas and soft, mature tannins. Food Pairing: Enjoy it with a variety of dishes, especially Prosciutto, vegetables, mushrooms and black truffles. Wine-Making Process: Long-lasting maceration over the skins and slow controlled temperature fermentation. Sharpening in oak tonneau-barriques and afterwards in bottle. Tasting Notes: Aromas and a layered palate of cherry, plum, raspberry, spice and hints of smoke on the finish. Wine-Making Process: The grapes are soft pressed then controlled temperature fermation then aged 10 months in French Oak barriques. The wine then ages in the bottle for an additional 6 months. Tasting Notes: Golden yellow color. Intense and complex scent with deep fruity and flowered notes. The wine has elegant structure, harmony and long aromatic persistence. Food Pairing: Sea-food, first plates with strong aromatic intensity, oily fish, boiled meats and herb-spiced cheeses. The company is characterized by a natural environment and climate very special, if not unique: its vineyards in fact take place by the first rays of the morning sun and take advantage of the cool evening breezes. The method of cultivation, strictly organic, always keep in view the dictates of the traditional Sicilian wine, bringing together the ancient teachings with the principles of sustainability and environmental friendliness. IRRIGATION: Drip irrigation from onsite lake. FERTILIZER: Organic in addition to integrating with microelement fertigation.